In an interview to this paper on Thursday, Chris Wood, a strategist at brokerage CLSA, made the astonishing claim that India was headed towards sovereign default. Wood made this claim despite conceding that only a paltry 1.6% of Indian government debt is held by foreign investors. Despite his outlandish claims, Wood was right on one thing. He said that an economic crisis in India could boost the BJP’s, and Narendra Modi’s, chances of coming to power, trumpeting the Congress’ so-called “failures” of economic policy. On September 5, writing in these columns, the BJP’s MP Yashwant Sinha argued exactly that. “We are plunging into a downward economic spiral, such as in 1990 and 1998. It is deja vu all over again,” he wrote. There is delicious irony in this. In 1990, Sinha was finance minister in the government of Chandrashekhar, when the bottom fell out of the Indian economy. The government’s policy response then was to ship all the gold in the Reserve Bank of India’s vaults off to the Bank of England as collateral for a loan. A few months later, the Congress put Sinha and the Chandrashekhar regime out of their misery. After Congress won the subsequent polls, Narasimha Rao became Prime Minister, and the reforms of 1991 kicked off. In 1998, by a peculiar coincidence, Sinha was again finance minister, this time in the BJP-led NDA coalition government. From 1997, the tsunami of the Asian crisis was blowing through markets. Despite that, Prime Minister Atal Bihari Vajpayee decided to go ahead with a nuclear pop in the desert of Pokharan. American sanctions followed immediately, and the economy tanked again. In March 2001, soon after Sinha presented his Budget, India experienced one of its worst market crashes: about $32 billion worth of market capitalisation was wiped out that month. The Calcutta Stock Exchange had a payments crisis. A bank in Ahmedabad went bust. The exploits of rogue trader Ketan Parekh were exposed. So, yes, Sinha knows a thing or two about economic crises. That is probably why he comes up with this gem about India today, “Multinational companies are losing faith in India. They believe that their money and assets are not safe here. Is that why Anglo-Dutch multinational Unilever pumped in $3.2 billion into India to hike its stake in its local subsidiary HUL in July this year? Or why US ratings giant S&P brought in dollars to buy out Indian subsidiary Crisil? Why didn’t AirAsia listen to Sinha’s advice while deciding to enter India this year? Actually, the best way to measure the confidence of foreign investors about India is to look at the annual inflows of foreign direct investment (FDI) into India. The chart alongside shows this, and the results are stark. In the NDA’s six years in power, a total of $23.8 billion entered India as FDI. The total for the nine years that the UPA has been in power is nearly 10 times that: $222 billion. This comparison could be unfair: after all, the UPA has ruled three more years than the NDA. So let us see the average FDI inflow per year under the NDA and UPA. In the NDA era, a little less than $4 billion entered India each year on average. 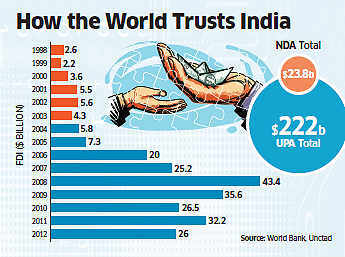 Under the UPA, this number stands at a little less than $25 billion, more than six times the NDA average. And here we have Sinha waxing eloquent over the supposed golden era of NDA administration. Meanwhile, the rupee is stabilising and equity markets have recovered from their funk. This could lead to a self-enforcing cycle: a stable or appreciating rupee boosts dollar returns for foreign equity investors. In any case, FIIs were net sellers only in the three months of June-August this year. As net buyers for the last nine months out of 12, they have reposed more faith in India’s markets than local whiners. Out of the eight trading sessions this month, FIIs have been net buyers in seven. Ashok Gulati, who heads the Commission for Agricultural Costs and Prices, wrote yesterday in these columns about the effects of better-thanaverage rainfall on farm growth, which he reckons could be a record high this year. The benefits of a bumper harvest are manifold. Tractor sales are already growing faster than 20%. After shrinking in May and June, industry grew in July, and will continue as government and private investments pick up. In the same month, inflation cooled marginally, after peaking in June. To cap it all, the country’s turnaround is coming at a sweet time when the great recession is coming to an end all over the world: growth has returned to the US and Europe, China’s slowdown seems to have bottomed out, Japan is growing after decades of stagnation. The BJP wanted to win polls by talking down the economy. Too bad, the economy wasn’t listening.